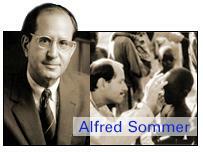 Professor Sormmer’s unique contribution was the discovery that vitamin A deficiency was responsible for widespread morbidity and mortality among children throughout the developing world, particularly from diarrhca and measies; and in his promoting efforts to control deficiency by travelling the world lecturing, assisting others in conducting appropriate research and advising government and international agencies in establishing effective public health control programs, Professor Sommer’s research represents a a major breakthrough, if not the most significant one, in the history of the public health during the past 50 years. He was the first to demonstrate that improving the vitamin A status of deficient populations could save lives and the sight of a million or more children every year, and reduce case-fatality from measles 50%. His pioneering research and advocacy, particularly the leadership he brought to the Internatinal Vitamin A Consulative Group (IVACG, whose Steering Commitee he chairs), resulted in the World Health Organization, UNICEF, FAO, the International Conference on Nutrition and the World Summit on Children, all propounding the goal of the ” virtual elimination of vitamin A deficiency by the year 2000. “Over 80 countries now recognize they have significant problems of vitamin A deficiency, up from only a handful at the time Sommer began his work over a decade ago. Some have already succeeded in eliminating xerophthaimia and others, vitamin A deficiency as a whole, Sommer spraked and continues to lead a worldwide effort of enormous commitment and potential.